Attend the 11th annual State of the Township Community Address to learn more about the plans that shape the future of Springfield Township. The informational program will recap the accomplishments of 2018 and provide an overview of the significant projects that will take place throughout 2019 and beyond. Careful planning and strong fiscal management over the past several years has put Springfield Township in a position to grow. Exciting times are ahead and you can be among the first to hear what plans are in the works. You are invited to attend the 11th Annual State of the Township community address. Springfield Township's State of the Township will be held at The Grove Banquet Hall on Thursday, April 18, 2019 at 6:30 p.m. (Located behind the Main Fire Station & Civic Center at 9158 Winton Road) You will hear a 30- minute informative presentation, designed for residents and business members to catch up on what is happening in the community. The format will include a review of 2018 accomplishments and an outline of major projects for the year. After the presentation participants will have an opportunity to speak one-on-one with their elected officials and Township staff. Can't Attend the State of the Township, but Interested In The Message? 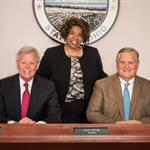 The Springfield Township State of the Township Community Address will be taped and aired on Time Warner Cable, Waycross Channel 23 and on Cincinnati Bell Fioptics, Channel 853. The video of the meeting will be available online at http://www.springfieldtwp.org/283/Trustee-Meetings-LIVE once it becomes available.